These five women were among the last who we taped using silent Super 8 film- we started using 'real' video in late 1984. Despite having to go from film to video, the picture quality is actually pretty good, though all footage has classical music dubbed. All five women posed in a series of swimsuits and dresses, and there is gymwork for all but Lisser. We did have 'real' video sessions with Leslie Barber and Sue Ann, and the footage here is included on those releases- WPW-65 for Sue Ann and WPW-28 for Joan. We never had follow up sessions with the other three. Joan Wood was in 'off-season' shape before it was fashionable, and shows off great size and shapes, particularly considering the era and that she was only in her very early 20's. 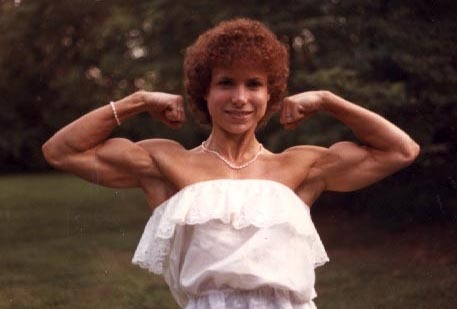 The other four women were in ripped contest shape and were top national stars at the time: Leslie was from New Jersey and was famous for her huge arms; Sue Ann arrived on the scene in 1983 and quickly threatened Kay Baxter with the 'most muscular' title; Alison Brundage was from Hawaii, competed for a short while, then retired, but also showed a lot of size, definition and vascularity for the era; and Lisser was the Sweden champ and had already turned pro.